Europa is one of the lovers of Zeus in Greek mythology, and arguably the most famous of a long line of lovers. The love life of Zeus was a cornerstone of Greek mythology for it explained the existence of many other characters in the ancient tales. The story of Europa was important for the relationship between Zeus and Europa would bring forth three sons, who would become important kings in their own rights, as well as establishing a royal line on Crete. Europa though was not from Crete, for she was actually a born a prince of Tyre, a region now to be found in Lebanon, for she was the daughter of King Agenor, and his wife who was either Telephassa or Argiope. Via Agenor, Europa was a great-great-granddaughter of Io, another famous lover of Zeus. Being a daughter of Agenor also meant that Europa was a sister to Cadmus, Cilix and Phoenix. As Europa grew into adulthood, it soon became apparent that the princess of Tyre was extremely beautiful, and if there was one thing that Zeus could not resist it was a beautiful mortal. Zeus was of course married to Hera, but being married had never stopped Zeus from trying to have his way with any one he fancied. Thus Zeus descended from Mount Olympus to Tyre, and then the supreme god morphed himself into a magnificent white bull. At the time Europa, with her attendants, at made their way down to the shoreline of Tyre, and there Europa was gathering flowers. Zeus, in the form of the bull, made his way up to Europa and her attendants, who were all quite taken with the seemingly tame white bull. 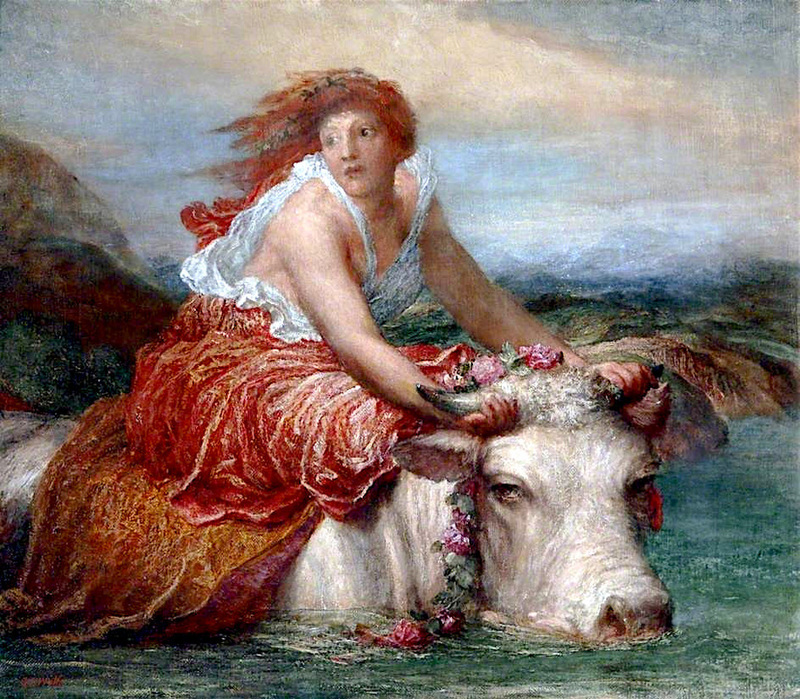 Zeus would lie at the feet of Europa, and eventually the daughter of Agenor would put down her flowers, and climb onto the back of the bull. 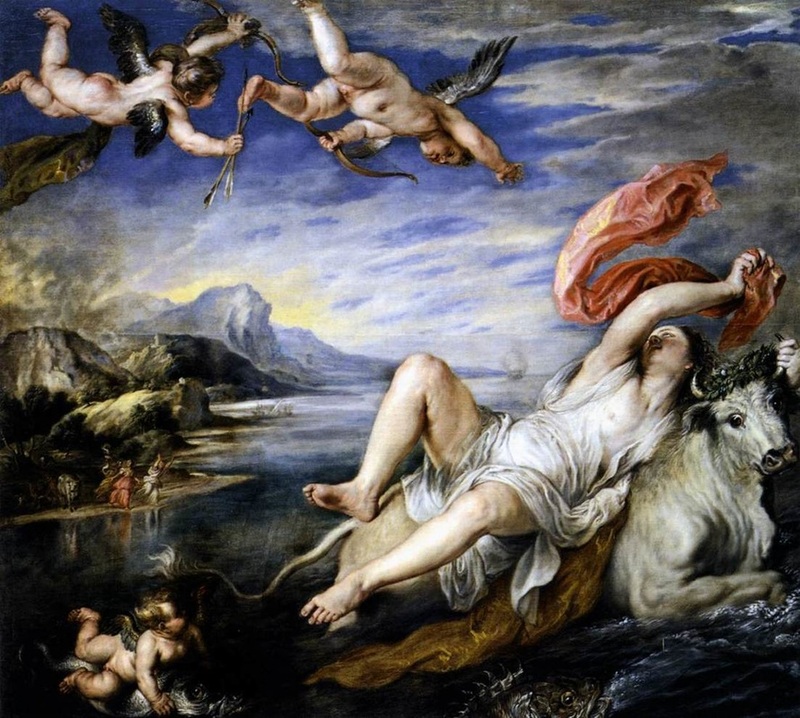 This of course what Zeus had planned all along, and as soon as Europa was seated upon his back, Zeus waded into the water, Europa was too scared to jump off initially, and then it was too late, for Europa and the bull were in deeper water. .Zeus would swim on across many miles of the Mediterranean Sea, until Zeus and Europa found themselves on the coast of Crete. Zeus then revealed himself, transforming for a bull into human form, and there on the coastline, beneath a cypress tree, Europa and Zeus consummated a brief relationship. From this relationship, Europa would become pregnant with three sons, Minos, Rhadamanthys and Sarpedon. Zeus would return to Mount Olympus, whilst Europa was left behind upon Crete; Europa though would prosper upon Crete marrying the regent, King Asterion. Asterion would subsequently adopt the sons of Zeus and Europa as if they were his own. 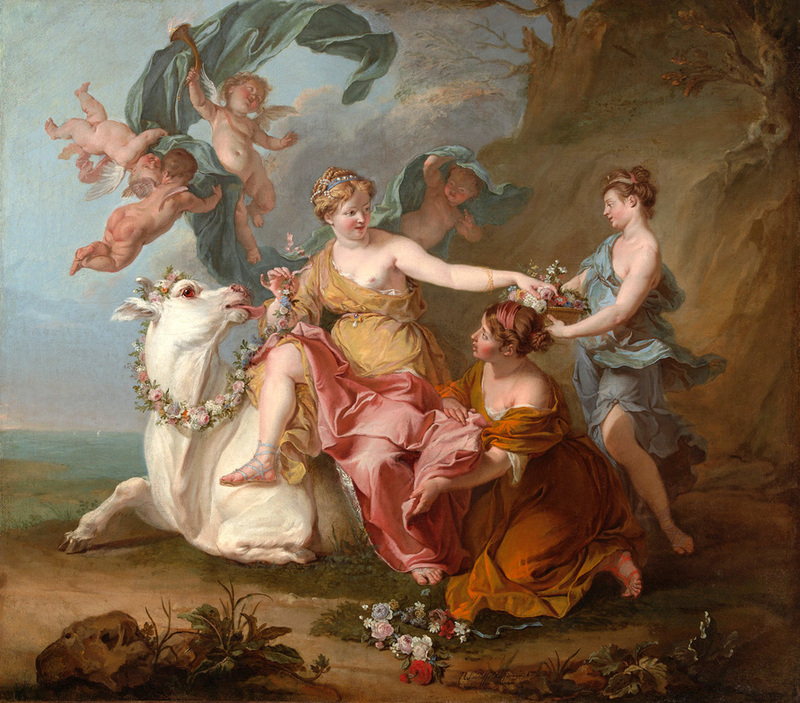 Zeus might have left his lover behind upon Crete, but the god had not abandoned Europa, and the new Queen of Crete was provided with a number of different gifts. Necklace of Harmonia –The first gift was a beautiful necklace crafted by the metalworking god Hephaestus. This necklace would later leave Crete and arrive in Thebes when it was given as a wedding gift for Harmonia. This necklace though was later said to have brought down a curse upon Thebes. Talos – Zeus also gave to Europa Talos, another creation from the workshop of Hephaestus. Talos was an automaton, a gigantic man crafted from bronze. Once on Crete, Talos would circle around the island three times a day, protecting the island, and therefore Europa, from any outside dangers. Talos would remain the protector of Crete until the arrival of the Argonauts generations later. Laelaps – Zeus also gave Europa Laelaps, the legendary hunting dog that was always destined to catch its prey. Laelaps would eventually be placed amongst the stars by Zeus when the god was faced with the problem that came up when Laelaps chased the Teumessian Fox, the prey that could never be caught. Magical Javelin – Europa was also given a javelin, enchanted so that it would always hit its intended target. After marrying Asterion, the story of Europa comes to a close, for although it has to be assumed that as a mortal Europa died, this is not recorded in the ancient sources. Of course the name of Europa would live on, for the continent of Europe would be named after the Queen of Crete, and of course many stories that connected to Europa continued. On Crete, Minos would become the king of Crete after Asterion, exiling Rhadamanthys and Sarpedon, who both then ruled over their own cities (Ocaleia and Lydia). Minos would create a dynasty of kings following his marriage to Pasiphae, and his bloodline would rule in the form of Catreus and Idomeneus. Minos and Rhadamanthys would also become Judges of the Dead in the Underworld. Important events were also underway in Tyre, for King Agenor had dispatched his sons, Cadmus, Cilix and Phoenix, to look for their lost sister. Now the brothers soon realised the impossibility of their task, and so rather than return to Tyre, they also established new city states, Cadmus founding Thebes, Cilix founding Cilicia and Phoenix founded Phoenicia.